A dog that is well taken care of is a happy and loyal dog. There are times you need to take yours for a walk and make sure it is comfortable or does not escape while at it. Collars do not provide the support and comfort your dog needs. For those dogs that pull on the straps, or have walking difficulties, investing in the best dog harness comes in handy. 1. What Is a Dog Harness? 2. What Does a Dog Harness Do? 3. How Does a Dog Harness Work? 4. Where Can I Buy the Best Dog Harness? 5. What Is the Appropriate Age for a Dog to Use a Harness? A dog harness provides more support and protects the dog’s neck from straining. In addition, it helps you control the dog; harnesses are safe and are good training gear for your dog. A good dog harness is hard to come by due to the overwhelming options and styles in the market. That is why we have compiled a list of the best dog harnesses you can buy. A dog harness comprising straps that wind almost all around a dog and are fastened using buckles to fit a dog’s body perfectly. The harness connects to a hook that is positioned at the dog’s back between their shoulders. Harnesses relieve the dog's neck of direct stress. Slip the dog’s neck through the harness’s neck piece, then pull the bottom strap under the dog’s belly and the top strap across its back before fastening the straps. 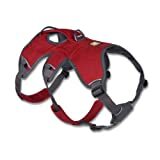 Online retailers such as Amazon have many sellers offering a variety of dog harnesses you can choose from. A harness can be used as soon as you train your dog. However, do not leave the harness on for long periods of time until the puppy fully grows and develops. You can take it off after the walk. We carried out extensive research by analyzing parameters such as features, pros, cons, prices, and sizes of these dog harnesses. We also considered what different customers had to say about different harness brands and where you can buy them. Our aim was to provide you with accurate information about the best dog harness brands in the market. Such research was necessary to make sure we present neutral views. The dog harnesses we reviewed range from $15 to $60. The difference in prices can be attributed to variation in features and custom build. For instance, the Ruffwear-Web Master’s high price can be justified since it is multipurpose, it offers maximum comfort and is made of high-quality durable material. This is by far the best dog harness for those dogs that walk with a pulling action. The chest strap is designed with a soft Swiss velvet lining which enhances comfort for the dog. Apart from being used to reduce pulling, it can also be used for exercise. It also features a patented action loop which positions at the back between the shoulders to enable your dog to walk in a straight line. The design of this dog harness keeps the spinal cords of the dogs aligned and is easy to use. On the front part is the structural connection ring convenient for controlling the attention of your dog especially during training. This product can be found on Amazon for around $40 to $45. These are the best dog harnesses for small dogs. In this category is the Puppia Soft Dog harness and the Puppia Ritefit harness. They feature an adjustable chest belt, a quick-release buckle, and a padded neck opening, all to enhance comfort. 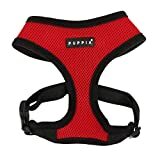 The best dog harness in this category will be the Puppia Ritefit Harness as it can be easily adjusted around the chest and the neck. The retail price of this product starts at around $14 to $20. If you want to take a car trip with your dog, then this is the best dog harness you can go for. It includes a 10-inch dog seatbelt, which helps confine the dog preventing distracted driving. The dog harness also has a front D-ring for the leash to stop the dog from pulling. Getting it on and off your dog is easy as it has five adjustable points a Weiner lock quick release buckles. This dog harness can be found on Amazon for around $25 to $30. The ergonomic design of this dog harness makes it easy for you to get it on and off. There is a mesh lining with a soft padding on the chest and the belly. Its outer layer is made of tough, scratch-free material and a large loading capacity buckle that enhances tensile strength. This is the best dog harness you can use to walk your dog at night since it is made of nylon webbing with 3M reflective material to improve visibility. This product can be found on Amazon for around $27 to $32. Ruffwear- Web Master has two leash attachment points where one helps control the dog and the other helps in walking the dog around. It is a safe and durable dog harness with a strong aluminum connection ring. 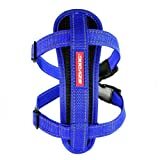 This harness provides balanced weight distribution and has padded straps that enhance comfort. It the best dog harness as it guarantees prolonged walks or runs with your dog. 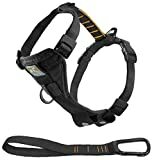 The dog harness can be found on Amazon for around $60 to $65. Dean and Tyler DT Dog Harness is made of a lightweight yet durable nylon material. It has two straps, three no-pull D rings, and a handle. The dog harness is ideal for any weather condition. 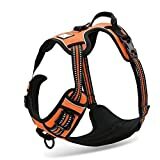 It makes the best dog harness for hiking, running, walking, etc. This product retails on Amazon for approximately $53 to $60. This dog harness is for medium-sized dogs with a girth measuring 28-34 inches. The leash attachment of this harness has a unique loop, and it directs the dog to your side. This is unlike in other harnesses thus making it the best dog harness. The straps perfectly aligns on the dog’s chest and belly, offering extreme comfort. It has four adjustment points to allow for an easy fit. This product can be found on Amazon for around $20 to $25. Sizes range from petite to extra large, with the smallest fitting dogs with chests of six to seven inches and the largest fitting dogs with chests up to 23.5 inches. Size:Small - Chest Girth 12.5"-16.4",Neck Girth 9.8".Please measure size before purchasing. Material:Made from 100% polyester,durable breathable air-mesh material,soft to touch. Safe:The back buckle and strap are tested to provided additional security to the fastener strap. As the name suggests, Pupteck is made from polyester which is known for its softness, and a durable air-mesh. It features a back buckle and straps that make it secure to use. This dog harness’s design ensures maximum comfort for your dog. It is great for when you are hiking, running or walking with your dog. This product can be found on Amazon for around $13 to $20. This is the best dog harness for big dogs. It is padded and includes a no-pull feature designed for such pets. The adjustable straps provide a perfect fit, securing your dog, and you will be able to control the dog easily with an additional handle. The harness also includes a secure heavy-duty D-ring that can control the dog. This product can be found on Amazon for around $17 to $23. This harness has an ergonomically designed chest plate that is made of EVA foam and perfectly aligns with the body shape of your dog to ensure control, comfort, and security. The buckles make it easy to get the harness on and off. It can make the best dog harness during the night thanks to the reflective stitching. The stainless steel D-ring enhances control and security. The dog harness can be found on Amazon for approximately $30 to 35. When choosing a dog harness, the emphasis should be on the quality. The best dog harness has a high-quality material construction which guarantees its durability. You should also consider the size of your dog and how comfortable and flexible it is. It is best if you analyze several varieties before settling on one. From our review, the Dean and Tyler DT Dog Harness is our best pick. This dog harness is designed to resist any weather condition, it is versatile, and it is easy to use and wash. This harness is a great value for its high-quality materials and design at a reasonable cost.